Torpix Hosting Review 2019: Is Torpix Hosting a Good Hosting? Torpix merged with Chkserv and is a London hosting company which offers WordPress hosting solution to small and medium business clients. The company offers a series of useful features which makes this company a solid competitor in the market. Chkserv is a newcomer in the hosting industry focused on providing cPanel and WordPress hosting services to clients who need easily manageable websites. The company is based in London as are their datacenters, which means this company is an excellent choice for anyone who needs a WordPress driven website with a U.K. IP address. The first option provides cPanel working environment which allows you full access to your website management system. It allows you to manage your emails, databases, domains, files, etc. It makes you the master of everything. cPanel is really easy to use and it mostly takes one or two clicks to accomplish what you want. There are three packages included with this plan, all of which come with an unlimited bandwidth, while the most popular, and most affordable includes the possibility of setting up three websites and 10GB of storage. Managed WordPress hosting option allows you to run your website with Chkserv taking care of day-to-day activities regarding the management of your website. It’s the pricier option but it takes away a lot of confusion. It comes with five WordPress installs which means you can run five websites with 4GB of RAM, 75GB of storage, and 4TB bandwidth. Both hosting plans include the latest equipment, and the storage hardware includes Samsung PRO solid-state drives that allow fast data readability. Additionally, no matter the plan or package you choose, there’s a free SSL certificate included, and this is not something you get with all the hosting agencies. 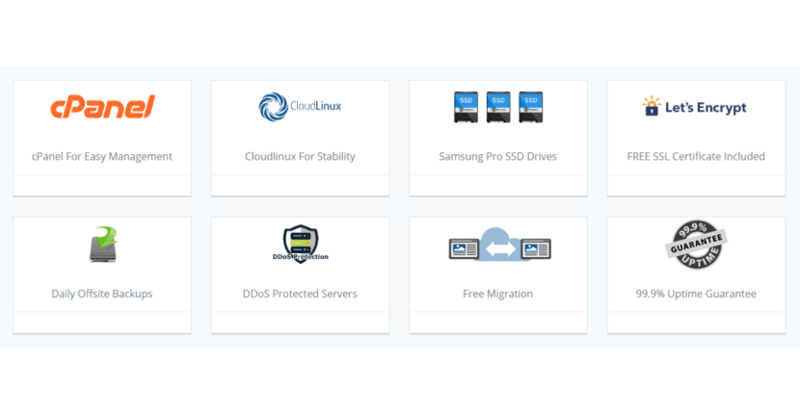 The stability of shared resources is due to CloudLinux which balances the resources so every user has enough to run their website properly. The data is protected from DDoS attacks, and the backups are performed every 24 hours with your data kept safely offsite. Most small operations tend to attract people with low prices; however, that doesn’t seem to be the case with Chkserv hosting. The prices are a bit higher than the worldwide industry standard as they are somewhat along the lines of the U.K. standard. You get a simple solution so you probably won’t need to hire a specialist to keep your website in check. In addition, there’s a lot of value in free SSL certificates, unlimited bandwidth, and loads of free third-party apps you can install. Moreover, auto updates of core and plugins add extra value to your package, even more so if you count the latest version of PHP which allows you to run all PHP based apps on your website. The support is available all the time, and it’s entirely U.K.-based available 24/7 via client portal and ticket system. Additional support comes in the form of ChkAid which is a paid service that provides you with non-stop WordPress support. Even though it’s a paid service, there aren’t many companies that offer this type of support. Chkserv is a small operation with a deep understanding of the market. They provide service to clients who are not too acquainted with online technology for a price that matches the service level and local economic standard. Wondering how Torpix Hosting stacks up against other Web Hosting companies? Enter any other Web Hosting company and we will give you a side-by-side comparison.